The St. Louis Cardinals have been beset by injuries in 2011, but it’s safe to say that when a moth flew into Matt Holliday’s ear last night, that topped them all. The bizarre incident happened during the top of the eight inning with the Los Angeles Dodgers batting. 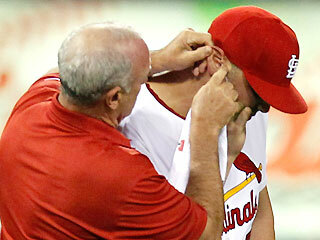 Suddenly, Holliday left the field holding his right ear after a moth became lodged in his ear canal. Ouch! Or more appropriately yuck! WATCH THE VIDEO HERE. According to the St. Louis Post-Dispatch, Redbirds’ trainers said the left fielder was taken into a dark room hoping the moth would “seek light” and fly out of the ear on its own. Not so much. A trainer then had to use tweezers to reach deep into Holliday’s ear and remove the pesky insect. This entry was posted in Injuries, Los Angeles Dodgers, St. Louis Cardinals, Strange and tagged Baseball, Los Angeles Dodgers, Major League Baseball, Matt Holliday, MLB, St. Louis Cardinals, Strange Injuries, tony la russa. Bookmark the permalink.